athroom panic has swept the country. The Obama administration’s May 13 directive to instruct public schools to allow transgender students to choose which bathroom they want to use, consistent with their gender identity, has sparked impassioned outrage among our elected public officials and general public nationwide. So far 11 states have sued the Obama administration over the legality of the measure. To say nothing of the barrage of blogs, articles and stories it has generated. This debate is a reminder of how a simple bathroom can advance or inhibit gender equality. Which leads me to The Great Bathroom Taboo – the story no one will talk about. Menstruation. Periods. Time of the month. The Curse. These stigmatized words carry with them significant educational, health, social, and economic consequences for girls and women all over the world. The lack of toilets, privacy, menstrual hygiene, and sanitation resources results in girls missing up to five days of school every single month. Many students cannot afford or don’t have access to basic menstrual hygiene products such as sanitary napkins, and must use unsafe alternatives like old rags that put them at risk for reproductive tract infections and other health issues. Lest you think the problem is “over there,” in the United States, Supplemental Nutrition Assistance Program benefits (SNAP, formerly known as food stamps) can’t be used for menstrual products. This leads some families to quietly sell their food stamps to cover the costs of tampons, sacrifice time at work and school, or risk significant harm to health due to inadequate menstrual hygiene management. One study in Uganda found that almost 62% of girls missed school each month while menstruating, talk about a significant and cumulative education setback. How can we talk about gender equality or hope to achieve it if girls cannot attend school like their male counterparts? 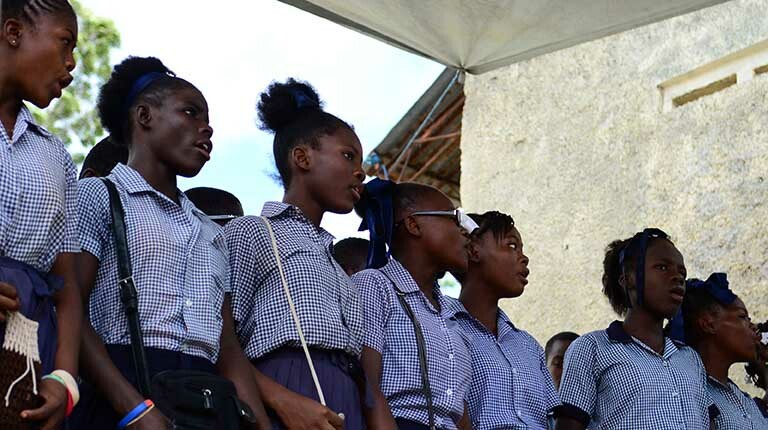 Focus groups with Haitian students, part of IMA World Health’s water, sanitation, and hygiene (WASH) project in schools confirms that many girls stay home from school due to the lack of privacy in their schools’ bathrooms and/or the lack of menstrual products and pain medications. It’s the taboo IMA is trying to address through improved school WASH infrastructure, education, and awareness-raising in students’ homes and communities. For anyone who cares about girls’ education, children’s health, reproductive health, or gender equality, making sure that Menstrual Hygiene Management is a part of the solution will improve the chances of a girl’s success. May 28th marks Menstrual Hygiene Day, an opportunity to loudly break the silence and spread the word about a ‘bathroom issue’ that affects women and girls everywhere, and therefore all people. Menstrual Hygiene Management education needs to be in school curricula and ideally, include young men who can go out of their way to tease girls about their periods in school. Increasing access to safe and private water and sanitation facilities at schools, and promoting the availability of high quality, environmentally-friendly menstrual products are proven interventions that promote a student’s well-being and success; more broadly, it really is true – a bathroom can advance or inhibit gender equality. Period. Learn more about Menstrual Hygiene Management in global health and development here and learn what you can do at the Menstrual Hygiene Day Alliance.